Marble is a beautiful stone that many engineers have chosen as the material form which to construct a variety of buildings. Residential and commercial buildings alike adorn this elegant stone. Yet, there are a variety of finishes that can be put on a stone's surface. One finish that is commonly found on marble surfaces is what is known as a honed finish. 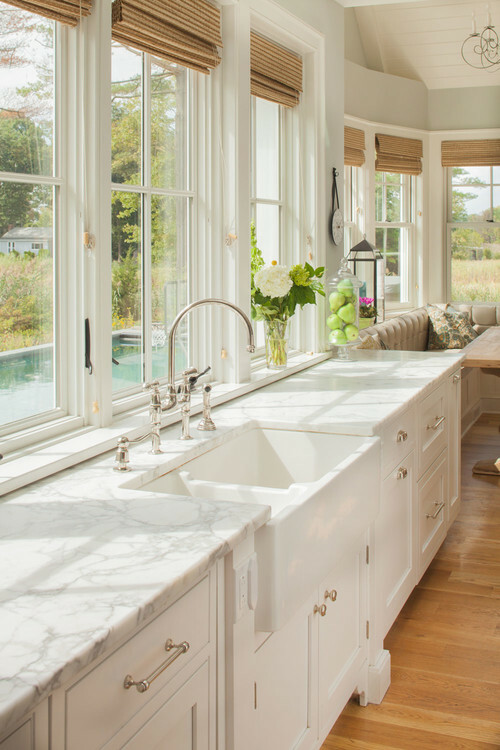 In this article we will look, not only at what a honed marble finish is, but also what you need to know if you have chosen (or inherited) a honed marble surface. "What does honed marble mean?" That is a question that is asked by people that have not explored the variety of stone finishes available. Simply stated, a honed finish is one that ends up somewhere between an unpolished surface and a polished one. The appearance of a honed marble surface is not as shiny as polished marble and it has a matte look to it. The image above is a photo of honed marble. As you can see, the sheen is very low on the stone's surface. The visual difference is clear when the two surfaces are placed side by side. And while some people prefer the look of a honed marble countertop, the difference in the surface's appearance brings with it some specific "need-to-knows". One of the biggest differences between polished marble and a honed slab (besides the visual appearance) is that the surface is more porous. This translates into different performance in specific ways. One benefit of honed marble is that it is more scratch resistant. This makes sense because the surface is not as smooth as a polished surface so a sharp object will touch only the peaks of the surface; leaving the valleys untouched. And because the surface is not completely smooth, when it does get scratched, it is not as noticeable since the surface is not as reflective. Another plus for honed marble is that when it gets wet, it is not as slippery as a polished surface. This makes it great for surfaces that accumulate moisture or get wet regularly. Although a honed surface has the aforementioned pros that go along with it, that is not to say that it will be the best choice for everyone. Hence, the title of this article. There are a couple of things that should be considered when determining whether honed marble is a good fit for you. One of the characteristics of a porous surface is that it allows liquids to penetrate the surface of the stone. This means spills need to be wiped up immediately. And, if the liquid is acidic, it would not hurt for you to rinse the stone thoroughly even after cleaning up the spill. Acidic liquids can create problems for calcite-containing stone like marble. In fact there are very particular ways to treat stains on marble. You may be wondering if there is a way to protect marble since it can be susceptible to penetrating liquids. The answer is yes it can. Using a penetrating sealer can help slow the rate at which harmful liquids are absorbed by a marble slab. Using a premium sealer and regularly treating the surface with a fortified polish can keep the marble resistant to stain-causing liquids. So if you like the look of a matte finished stone, honed marble might be the way to go. Especially in high traffic areas, for bathroom floors, or pool areas. However, if you choose honed marble, what you need to know is that, as a general rule, you will need to wipe up spills quickly and as with all marble, a good sealer will help too.